RwandAir has once again suspended flights to Mwanza, about 6 month after relaunched operations to the Tanzanian city. According to John Mirenge, the route was not profitable, as earlier anticipated. "RwandAir has just announced that they will resume flights to Mwanza, Tanzania’s lakeside city, effective 01st of November this year. Flight WB 470/1 will operate initially every Monday, Wednesday and Friday, using the airline’s Bombardier Q400NextGen, leaving Kigali at 13.30 hrs local time and arriving in Mwanza at 15.30 hrs local time (one hour time difference). The dual class cabin configuration offers passengers across the network, even when travelling on the turboprob aircraft, the choice of premium services besides economy class." 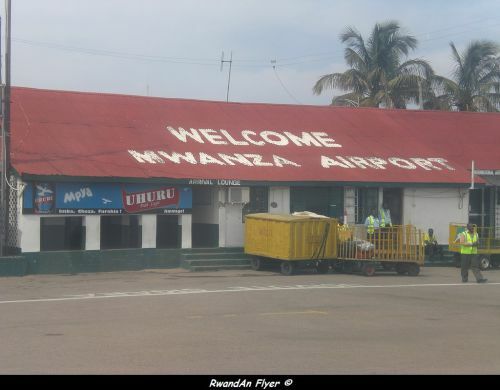 More one year after its suspension, RwandAir will resume Mwanza service, in coming month, according the RwandAir Inflight Magazine "Inzozi", issued this month. The route could be operated both with CRJ-900NG and Dash Q400NG. RwandAir started flights to Mwanza, in July 2012, becoming the third destination served by the airline in Tanzania, after Kilimanjaro and Dar Es Salaam. According to Amadeus (21 JAN 2013), from 31 JAN 2013, RwanAir will suspend all flights to Mwanza. Currently, the airline provides a four weekly service via Bujumbura (Burundi), with CRJ-900NG.